Dream Cortex’s Baby Flash Cards Reaches 10,000 Downloads! We are very happy to announce that our first Apple iPhone App, Baby Flash Cards, has exceeded the 10,000 downloads mark over just two weeks. We would like to say thank you to those of you who have downloaded the app and we are glad that you enjoy playing it with your kids. Baby Flash Cards now ranks number 27 on Apple Store as the most popular iPhone Apps under the education category, and ranks numebr 13 under the free download education category. We have the latest version of Baby Flash Cards uploaded to Apple Store, with the reported bugs and errors being fixed. Thanks again to those who sent us the bug reports. If you have any questions about our Baby Flash Cards or would like to learn about using iPhone as the platform for Advergames and brand building, please feel free to contact us by sending an email to pr@dreamcortex.com. Check out this very first iPhone App by Dream Cortex – Baby Flash Cards, a handy educational tool for moms and dads to play with their kids, at anytime and anywhere with an iPhone. It has over 200+ vocabulary Flashcards with nice illustrations, easy to use and it’s totally Free! 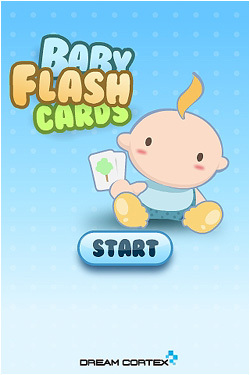 You may download Baby Flash Cards to your iPhone or iPod Touch from the Apple Store here. It requires iPhone Software Update version 2.2.1 or above. Since this is our very first iPhone App development, we know that we still need a lot of improvement. So your valuable comments are always welcome and important to us. Please email us to info@dreamcortex.com for any suggestions. Enjoy Baby Flash Cards with your kids!